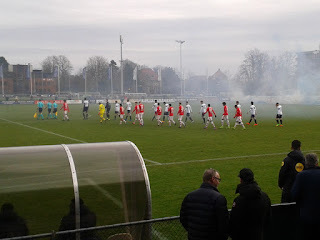 The Dutch third-level fixture between Koninklijke HFC and Jong AZ on 25 February was a meeting of two clubs who have experienced contrasting fortunes so far this season; Jong AZ are the runaway leaders of the brand spanking new Tweede Divisie (introduced at the start of the season by the KNVB as part of a raft of reforms to the Dutch football pyramid) and were fourteen points clear before kick-off, whilst "the Good Old HFC" were fourth from bottom. 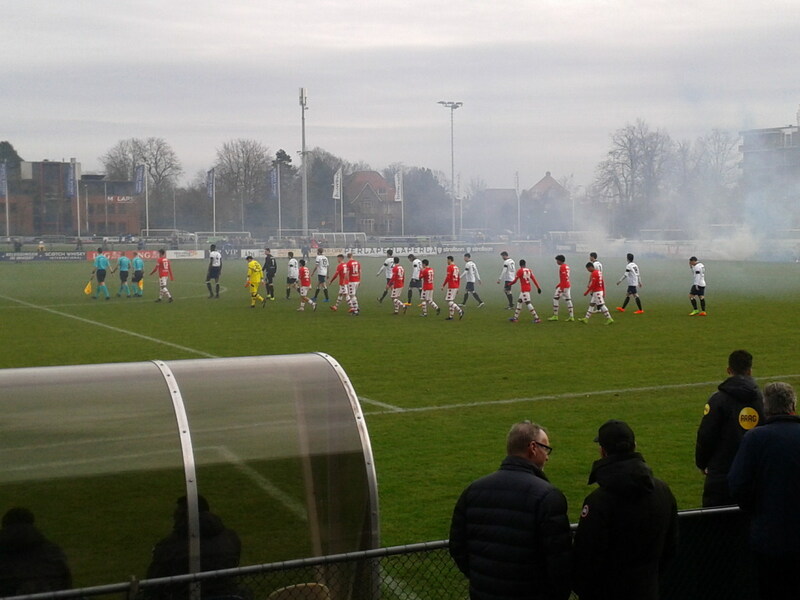 Nevertheless, a decent crowd turned up at the Spanjaardslaan in Haarlem to see whether the hosts could temporarily halt Jong AZ's seemingly inexorable march towards the Eerste Divisie and get back to winning ways after losing their last two matches. It was also a chance to exact revenge for a 5:1 battering suffered in Alkmaar in September. It was Jong AZ who made most of the running during the first half, however, and almost broke the deadlock in the 7th minute when Levi Opdam's dive towards an inviting cross from Myron Boadu only just failed to connect. 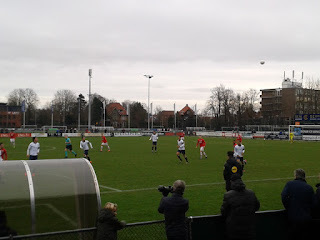 Jop van der Linden was denied by a clearance just in front of the goal-line a few minutes later, and after Wouter Haarmans was foiled by some last-ditch defending at the other end, Jamie Jacobs' scuffed volley from the edge of the six-yard box was well saved by HFC's veteran goalkeeper Gerard van Rossum. The first twenty minutes was almost all Jong AZ, with Calvin Stengs being the focal point for most of their attacks and defenders Pantelis Hatzidiakos and Joop van der Linden nullifying any threat from Koninklijke HFC. Van der Linden also tested van Rossum with a wickedly swerving long-range effort as the visitors kept up the pressure, but the HFC man was equal to it. HFC came more into the game as the half wore on but were unable to capitalise on an error from Jong AZ 'keeper Nick Olij, who failed to control a back-pass and almost played his team into trouble on the edge of his penalty-area, but recovered to dribble past two HFC players and play the ball to safety. With five minutes left of the first half, van der Linden's curling free-kick from 25 yards out caught everyone out and clipped the top of the crossbar. HFC were defending stubbornly but attacks were mostly limited to long balls towards Wouter Haarmans up front, who was running his socks off for no reward, and Koen Beeren, who was similarly frustrated despite his best efforts. Finally, though, with four minutes to go to the break, the hosts finally delivered a shot on goal through Nigel Castien, an acrobatic half-volley from the edge of the penalty area which caused Olij few problems. Moments later, the ball was up the other end of the pitch and nestling in the back of the net. Opdam's curling piledriver from the edge of the box took the slightest of nicks off the top of an outstretched HFC leg, flew over the already airborne van Rossum and into the net to give Jong AZ the lead in the 43rd minute. HFC came close to equalising seconds later, but a well-delivered cross failed to find anyone to turn the ball in. HFC survived another scare as the half came to an end, van Rossum getting down to save a toe-poke at the bottom of his right-hand post, but they went in a goal behind to a Jong AZ team who deserved their lead, though they were finding it all more of a struggle than perhaps they themselves had anticipated prior to kick-off. Half-time saw little girls treading carefully past the front of the stand with pitchers full of juice almost too heavy for them to carry, giddy schoolgirls taking group photos of each other, and an elderly chap being escorted from the stand by a steward to finish off his glass of beer. It also saw the game's first substitution: HFC's Vince de Kwant made way for team-mate Kevin Sterling. 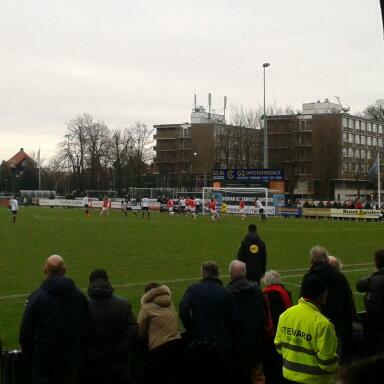 The second half started with Koninklijke HFC showing much more industry and, on occasion, no little guile. In a game of fairly few chances and even fewer talking-points, there was consternation amongst the home support a few minutes after the restart when van der Linden pulled back Wessel Boer, who had shown him and the rest of the Jong AZ team a clean pair of heels, but referee Puts resolutely refused to give a free-kick to HFC, let alone a yellow card to the visiting defender. After Jong AZ's Hatzidiakos almost caught everybody out with a long-range effort that fizzed wide of goal, team-mate Nick Doodeman almost doubled his team's advantage on the hour when he rose to meet a cross from the right at the far post; his header looped across the face of goal only to strike the inside of the post, and the ball was eventually cleared with difficulty. HFC's Hols was contributing more and more to his team's cause with some penetrating runs, and he sent in a low cross which only just evaded Koen Beeren's despairing lunge. The two of them combined to thread a ball through to Vince Sterling two minutes later, but he was foiled by a tackle from the last defender. Jong AZ indulged in a little Route 1 football with a quarter of an hour to go; goalkeeper Olij sent the ball up towards midfield, where Ferdy Druijf outran the defence, latched on to the ball and thrashed the ball towards van Rossum's goal from the edge of the area, but the veteran saved well, putting the ball behind at his left-hand post. Beeren and Tim van Soest both had half-chances for the home side, whilst the visitors wasted another chance in the 84th minute, which ended up in the arms of van Rossum with Driujf again frustrated. HFC were still furiously attempting to create chances as the game entered injury-time, but the closest they came was when van Soest blazed the ball over Olij's goal in the 91st minute. There was plenty of resolve from Koninklijke HFC, particularly during the second half, but inspite of an impressive showing from Hols and the HFC midfield, Jong AZ held on fairly comfortably to consolidate their lead at the top of the table. Haarmans, Castien and Beeren also played well for the hosts, while AZ's defensive partnership of van der Linden and Hatzidiakos remained steadfast and team-mates Opdam, Stengs and Boadu showed both speed and skill. Jong AZ were outstanding at times, whilst Koninklijke HFC can take heart from a good second-half display, but they will need to create - and take - more chances in the coming weeks. POSTSCRIPT: Since the above match was played, Jong AZ have increased their lead at the top of the Tweede Divisie to 18 point, whilst Koninklijke HFC have moved up to 11th place after winning three matches in a row.